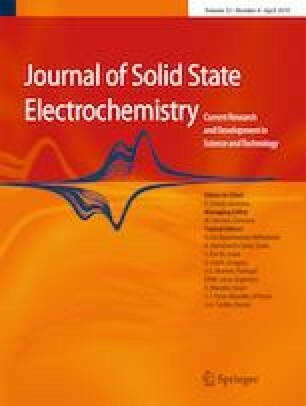 A series of Fe(III)-based coordination-driven metallogel (MOG) electrolytes are obtained by absorbing liquid electrolytes with MOGs and applied to quasi-solid-state dye-sensitized solar cells (DSSCs). The MOG, prepared by Fe3+ and trimesic acid, presents a porous and flower-like structure, which can ensure the effective diffusion of I−/I3− ions and excellent infiltration to the TiO2 photoanode. Moreover, the mechanical property of MOG is stable enough to guarantee the photovoltaic performances of DSSCs in the operating environment. In the MOG electrolyte, trimesic acid acts as the gelator to coordinate with Fe3+ to form MOG. Furthermore, the condition of TiO2 conduction band edge of quasi-solid-state DSSC shifts with the liquid electrolyte concentration increasing in MOG, which results in both Voc and Jsc increasing firstly and then decreasing, and the process of electron kinetics is investigated to illustrate these differences. Finally, an excellent photoelectric conversion efficiency of 5.31% is obtained for MOG electrolyte–based quasi-solid-state DSSC. The online version of this article ( https://doi.org/10.1007/s10008-019-04258-w) contains supplementary material, which is available to authorized users. This work was supported by the National Natural Science Foundation of China (No. 51602095) and Anhui Provincial Natural Science Foundation (No. 1708085MB31).